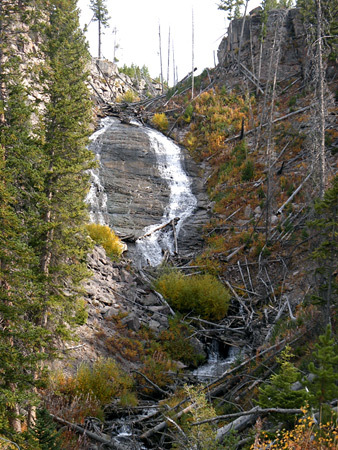 Wraith Falls is a 100 foot cascade formed by Lupine Creek, a relatively small drainage, as it flows down a rocky section of the hillside at the edge of Blacktail Deer Plateau in the northwest of Yellowstone National Park. The creek spreads out across the cliff face to create a pretty, white, almost ghostly effect, and the 0.3 mile trail to the viewing area at the base makes a pleasant, easy hike, a good choice for families with young children. 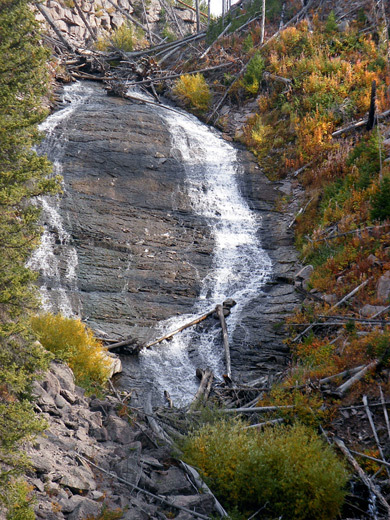 The Wraith Falls Trail begins along the Grand Loop Road five miles east of Mammoth Hot Springs and one mile from the more well known Undine Falls on Lava Creek. Lupine Creek is a tributary, joining the larger stream close to the highway after flowing for 7 miles across the plateau, originating high on the slopes of the Washburn Range. From the roadside parking area, the mostly level trail traverses a sagebrush meadow and a small stream, winds past a few tall Douglas fir trees, crosses Lupine Creek on a wooden bridge then climbs slightly to a newly-fenced viewpoint about 200 feet from the base of the falls. The steep canyon walls make a closer approach somewhat difficult but the cascade is near enough to the end of the path for a good view, and presents an photogenic spectacle as the stream tumbles down the smooth, steeply-sloping rock face, even though the amount of water is quite small for most of the year. As with all Yellowstone's waterfalls, Wraith is most powerful in early summer when the winter snows are melting.